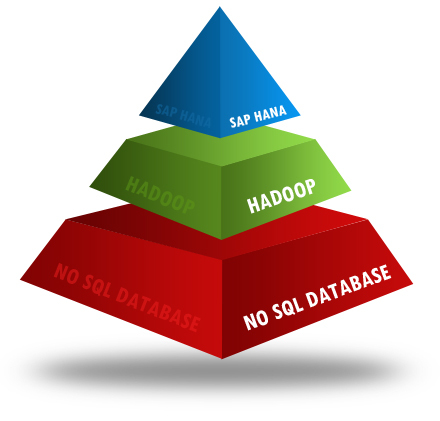 JD Soft Data Architects will assist you to run SAP ECC | Business One | HCM| SCM |CRM to run on private cloud with SAP HANA. Apart from SAP, we can integrate other ERPs such as People soft, Marshall, and Microsoft.net with HANA. We can support you mapping your organizational business objective with SAP HANA which Includes possible patching & upgrade, enhancement, modernization of database, functional & technical integration. We’ll be able to support in implementing remote HANA environment in your own premises and support and maintain the platform with all possible integrations. Harnessing the power of Hadoop with Big Data JD Soft Practice group can integrate the Apache Hadoop software library that allows for the distributed processing of large data sets across clusters of computers using a simple programming model. We map and integrate Apache Hadoop to scale up from single servers to parallel thousands of machines, each offering local computation and storage unique to Hadoop and its subprojects including Hadoop Distributed File Systems (HDFS), Hadoop Map Reduce, Hive, Pig, and H Base. Store large amounts of data. We collaborate with your functional and IT team to store data without a need to change it into a different format that is common in a traditional data warehouse. Scaling through distributed processing. While Hadoop is used for large-scale data processing with petabytes of data, many organizations using Hadoop are performing data processing tasks that are at terabyte scale. With its Map Reduce framework, JD Practice team may abstract the complexity of running distributed, shared-nothing, data processing functions across multiple nodes in the cluster, making it easier to gain benefits of scaling. Cost advantage. While comparing with other In-memory tools, Hadoop is open source software that runs on commodity hardware, and you can add or retire nodes based on your project objectives. We can show large cost advantage in Hadoop, which is driving many organizations to add Hadoop clusters in their data processing investment portfolio, rather than replacing the existing portfolio. With our Consulting led approach and leveraging Hadoop platform we can showcase how storing and processing data in Hadoop is cost effectively helping organization to harness more data for projects that were not making “business” sense previously. R – Programming has become mandatory for every corporate to analyze their production, inventory, retail, manufacturing, financial data to achieve organization objectives. We support product development organizations in European and US for the following in JAVA and J2EE platform. Provide Remote Administration of many customer environments – this to include but not limited to the following: system monitoring, reviewing systems logs for errors, review Oracle settings, system patches, clean up unreferenced files, maintenance build updates, performance tuning, and issue resolution. Provide customers with monthly status reports on system status.